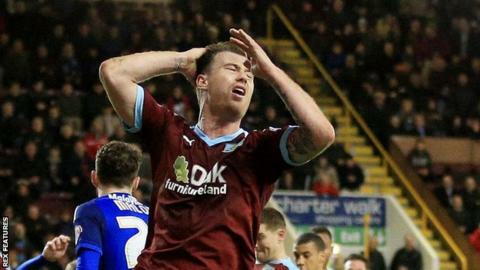 Burnley's title hopes suffered a setback as they were held to a goalless draw by play-off hopefuls Cardiff City. Cardiff keeper David Marshall denied Andre Gray and George Boyd on a frustrating night for the leaders. The Scotland stopper also saved from Sam Vokes and Ashley Barnes late on as Burnley's lead at the Championship's summit was cut to one point. Russell Slade's side deserved their draw, although they are now four points behind the play-off places in seventh. Substitute Kenneth Zahore struck the crossbar late in the game for the Bluebirds, who have not lost to Burnley in nine years. The Clarets extended their unbeaten run to 17 games but second-placed Middlesbrough are only a point behind them after a 3-0 win over Huddersfield. Cardiff showed early intent with Tom Lawrence's curling shot deflected wide for a corner while former Cardiff keeper Tom Heaton saved Stuart O'Keefe's effort. Burnley grew into the game with David Jones forcing a save from Marshall while Boyd was denied by Sean Morrison's well executed last-gasp tackle. Top scorer Gray had Burnley's best chance of the half when his first-time shot was smartly saved by Marshall, who also denied Boyd before the break. Cardiff continued to frustrate Burnley after the interval with Wales striker Vokes heading over the bar from Joey Barton's cross. Matthew Lowton's dangerous low cross into the six-yard box was stabbed away by Marshall before Vokes could pounce. At the other end, Lex Immers fired wide before substitute Zahore's lob over Heaton struck the crossbar. Burnley could have secured victory in stoppage time but Vokes and substitute Ashley Barnes were denied by Marshall. "It's another clean sheet, I think that's 16 this season, it's rare that we don't score a goal. "We're the highest scorers in the division. If you keep making chances like that, you are going to score some goals. "The one thing we can do is focus on ourselves, we cannot define what everyone else is going to do." "I didn't think it would end 0-0. It was a typical Championship match. "Who knows how many points it will take to nick one of those play-off spots." Match ends, Burnley 0, Cardiff City 0. Second Half ends, Burnley 0, Cardiff City 0. Attempt saved. Ashley Barnes (Burnley) left footed shot from the left side of the six yard box is saved in the centre of the goal. Assisted by Matthew Taylor with a cross. Corner, Burnley. Conceded by David Marshall. Attempt saved. Sam Vokes (Burnley) header from the centre of the box is saved in the bottom left corner. Assisted by Matthew Taylor. Attempt missed. Joey Barton (Burnley) right footed shot from outside the box misses to the right. Kenneth Zohore (Cardiff City) hits the bar with a left footed shot from the centre of the box. Assisted by Lex Immers with a through ball. Attempt saved. Joe Ralls (Cardiff City) left footed shot from a difficult angle and long range on the right is saved in the centre of the goal. Corner, Cardiff City. Conceded by Stephen Ward. Attempt blocked. Lex Immers (Cardiff City) left footed shot from the centre of the box is blocked. Assisted by Kenneth Zohore. Attempt missed. Lex Immers (Cardiff City) right footed shot from the centre of the box misses to the right. Assisted by Kenneth Zohore. Substitution, Cardiff City. Craig Noone replaces Tom Lawrence. Substitution, Cardiff City. Kenneth Zohore replaces Stuart O'Keefe. Attempt blocked. Tom Lawrence (Cardiff City) left footed shot from outside the box is blocked. Assisted by Scott Malone. Offside, Cardiff City. Lee Peltier tries a through ball, but Lex Immers is caught offside. Stuart O'Keefe (Cardiff City) wins a free kick in the defensive half. Attempt missed. Sam Vokes (Burnley) header from the centre of the box is too high. Assisted by Joey Barton with a cross. Offside, Cardiff City. Scott Malone tries a through ball, but Lex Immers is caught offside. Substitution, Cardiff City. Aron Gunnarsson replaces Anthony Pilkington because of an injury. Substitution, Burnley. Matthew Taylor replaces Scott Arfield. Offside, Burnley. Matthew Lowton tries a through ball, but Joey Barton is caught offside. Attempt missed. David Jones (Burnley) left footed shot from outside the box is close, but misses to the right. Attempt saved. Stuart O'Keefe (Cardiff City) right footed shot from the centre of the box is saved in the bottom left corner. Assisted by Anthony Pilkington. Offside, Burnley. George Boyd tries a through ball, but Sam Vokes is caught offside. Second Half begins Burnley 0, Cardiff City 0. First Half ends, Burnley 0, Cardiff City 0. Attempt saved. George Boyd (Burnley) left footed shot from the centre of the box is saved in the bottom right corner. Assisted by Stephen Ward with a cross. Attempt blocked. Joey Barton (Burnley) right footed shot from outside the box is blocked. Assisted by Matthew Lowton. Offside, Burnley. Matthew Lowton tries a through ball, but Andre Gray is caught offside.